The wider region surrounding the star cluster RCW 38, located about 5500 light years away in the direction of the constellation Vela (the Sails). Most baby stars aren't born in gentle cosmic cradles, but ratherin violent clouds full of powerful winds and blazing light. New images taken bythe European Southern Observatory (ESO) offer a peek into one of these chaoticbirthing grounds. The observations reveal starsbudding amidst an onslaught of radiation from other nearby stars andejected matter from supernovaexplosions of dying stars. 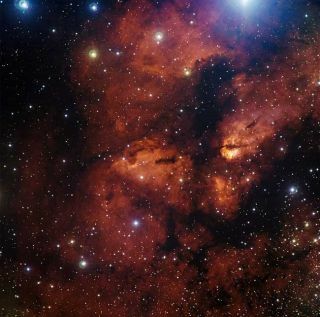 Researchers focused their attention on a cloud called RCW38, located about 5,500 light-years away. In this dense collection of gas anddust, many stars are born, live and die. In fact, scientists think our own sun and solar systemlikely formed in a clusterlike this one, rather than a more sparse suburban region of the Milky Way. "By looking at star clusters like RCW 38, we can learna great deal about the origins of our solar system and others, as well as thosestars and planets that have yet to come," said Kim DeRose, first author ofa paper on the new study in the July issue of the Astronomical Journal. DeRoseworked on the project when she was an undergraduate student at theHarvard-Smithsonian Center for Astrophysics in Cambridge, Mass. The new pictures are the sharpest images yet of RCW 38,taken with the NACO adaptive optics instrument on ESO?s Very Large Telescope inChile. The photos reveal that the object called IRS2, which appeared to be amassive star in the center of the cloud, is actually two separate starsrotating each other in a binary system. This system glows in searing white-blue light, the hottestrange for stars. The strong radiation pouring out of IRS2 energizes anddisperses nearby gas that might otherwise collapse into new stars, or thatmight form protoplanetary discs around developing stars. If not disrupted,these discs can eventually give rise to new solar systems with planets, moonsand comets like our own. The overbearing binary system in the center of the clouddoesn't seem to have trampled all nearby star formation. The researchers founda few protostars, which are faint infants on their way toward becoming fullstars, in the field. And in crowded clouds like RCW 38, supernova explosions arealso common. These dying throes of massive stars scatter matter throughout thecloud, including heavy elements and rare isotopes of chemicals that then getswallowed up into other stars forming nearby. Detecting some of these isotopesin the sun is one way astronomers can tell our own origins trace back to achaotic cradle like this.